Human tree spawn detection: will remember the trees that were cut last. Q: Status is stuck on "Waiting for tree spawn" when the selected tree is up? Script is on SDN now, if you can't find the script clear your browser cache. Thanks for this! 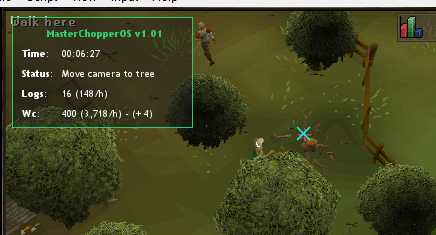 Running into a banking issue when running chopping regular trees at Varrock big bank. Edit: I think the issue only happened whenever a tab other than my inventory was opened. Leaving the script alone should prevent this. Now opens inventory when required. It's random upon script starting , I'll slow the fastest mousespeed down a little. Could you send me screenshot where it is also does it require any quests since my test account doesn't have any quests done. When I start the script i sat thre for 2 minute and it just said loading. What am i doing wrong? I just got this and i'm chopping yews down at seers village. The status keeps on saying waiting for trees to spawn, even tho there are trees there. If you can fix this that would be great thanks!!!! Did the settings menu popup if not restart rsbot and try again. If you did select a location it's possible you were at the wrong location. Post a screenshot and tell me the location you selected. I'll check this out, does it wait until the tree you cut down before respawns? Ran the script to cut willows at draynor but it keeps saying waiting for trees to respawn. When you take a picture can you make sure, you also enable view -> objects. Did it try to move the camera by itself (like the status said)?